So that's around £312.55 then! 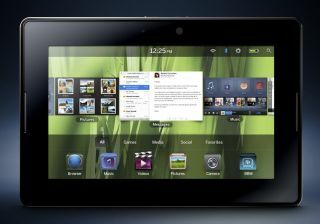 Research in Motion’s forthcoming tablet PC, the BlackBerry PlayBook, is set to cost less than $500 (around £312) according to RIM’s CEO. RIM’s co-CEO Jim Balsillie told a Korean interviewer that RIM's 7-inch tablet computer will be "very competitively priced" and should be "under" $500 when it arrives in North America early in 2011. A UK launch should follow soon after the US launch, although we still await official details on UK launch dates, pricing and will bring you those as soon as we have them. RIM follows numerous other vendors into the tablet PC market, including Asus, Acer, ViewSonic, HP, Samsung, Motorola and others. Apple currently owns 95 per cent of the tablet PC market with the iPad. Apple has sold over 4.19 million iPads to date. The iPad’s dominance will “change when we’re in the market,” said the RIM CEO.